In our continuing series of author interviews, we speak to Audrey J. Cole, author of intense thrillers The Recipient and Inspired by Murder. Recently returned to the west coast after years in Australia, her medical-themed murder mysteries are winning over many fans with their perfect blend of taut thrills and procedural panache. HG: So, first off, who is Audrey J. Cole? I saw that you just returned from years living in New South Wales to your original home in Washington state! What took you all the way across the world? And what’s it like to be back? 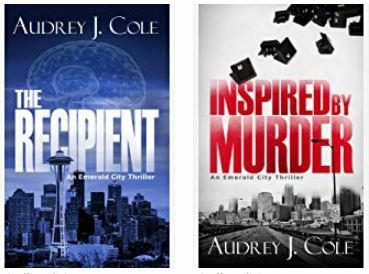 AC: I’m a registered nurse who is fascinated with true crime and thrillers, so I put the two together and write crime and medical thrillers set in Seattle. I have a one-year-old and a three-year-old (and a cat, ha). I’m from the Seattle area but lived in Port Stephens, Australia for the last 5 out of 6 years – but I’ve been back in Washington state now for just over a year – and we’ve had a snow storm on and off for the last 2 weeks, so I am missing Australia very much right now! We moved to Australia for my husband to get a PhD over there. I’d always wanted to be a writer, but it always felt like more of a dream than a reality. When we moved to Australia, I didn’t work for the first few months, so I wrote a large part of what became my first published novel, The Recipient. For the first time, it seemed like being an author might actually be possible. HG: So how long did it take to write The Recipient in all? AC: Oh man. A long time! ha. I had started writing it before we moved to Australia, which was in 2013, so I think it took me nearly 4 years! My second novel went much quicker compared to that. It took me about 18 months. But I also had a toddler, was working, then had a baby and we moved countries during that time! 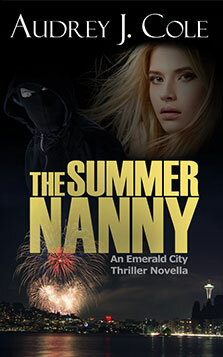 Now, I’ve written a novella, which will come out in April, and I’m working on the next full-length Emerald City Thriller. HG: Did you plan out either novel in advance? AC: Not really. Both novels started with an idea, inspired from true crime. And then the characters just grew lives of their own as I wrote. But, now, I’ve started outlining, and the writing process seems to go quicker. HG: Do you have a writing schedule? Like a specific time to sit down and write? Well, I would love to say yes, I get up every morning at 4am and write until my kids get up at 7, but I don’t. ha. I do try and write every day when my son is napping, and then for an hour or two after my kids go to bed. I’m a night owl, so that seems to work best for me. I can’t seem to force my brain to work really early in the morning. Thriller author Rachel Amphlett gave me some great advice when I first started out. She said: “Have a daily writing habit. Write every day.” I still struggle with it, but I think consistency is really important. HG: So, what’s the best advice YOU have for other writers? AC: My advice would be read widely, especially in the genre that you write, because I think it makes you a better writer. Also, I would say learn from other authors. We are so lucky with the internet today that you can connect with other authors in a number of ways, and there are so many benefits to that. Writing can be a lonely business if you’re not connecting with other people. You can find the fit for your personality and schedule, whether it’s listening to a podcast, reading a blog, joining a Facebook group, or watching a webinar or something on YouTube. There really is a ton of information out there for authors. In Australia I used to go to a monthly writer’s group, where we actually met once a month and shared our work. It was really helpful and fun, but not everyone can work something like that into their schedules. HG: So, tell me who your favorite books and authors are! AC: A few of my fav authors are Jennifer Hillier, Ann Rule, and Robin Cook. 3 fav books would be Three by Ted Dekker, The Butcher by Jennifer Hillier, and Poison Bay by Belinda Pollard. HG: And, finally – how can readers find you if they want to read more? AC: Here’s my website, facebook, bookbub profile and my Amazon Author Page. And here’s the cover of my next book, due out in April but on preorder now. Thanks so much to Audrey for taking the time to speak to us! And, remember, if you like the sound of her books – you’ll get the opportunity to read others just like hers, plus titles from 15 other genres, when you sign up to Hidden Gems.